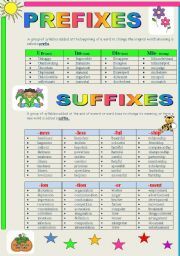 A guide with suffixes and prefixes to help students learn new words. Hope it´s useful. 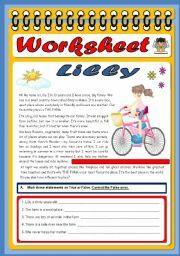 Comprehension exercise-True/False; Answering questions; opposites; verb tenses. 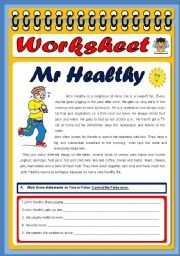 This is a simple worksheet to revise the human body and colours. Hope it´s useful. 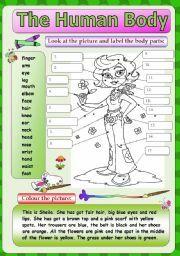 Test about school. True/false, answering questions,completing an easy dialogue,verbs in the simple present and present continuous,composition. 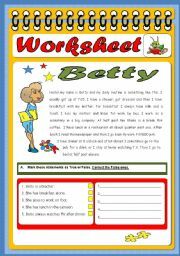 Worksheet wih comprehension exercises (True/False-Answering questions-Antonyms-Verb tenses). Hope you find it useful. 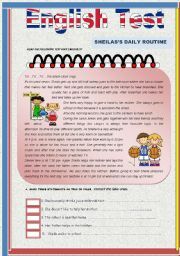 Daily Routine Worksheet. True/False-Answering questions-Simple Present Tense-Personal pronouns. Hope you like it. Guess the shopping places. Hope it´s useful.